Visual Micro is a plugin for Microsoft Visual Studio (with C++ installed). Visual Micro helps you create Arduino compatible cross-platform programs for hundreds of different Arduino compatible micro-controllers. 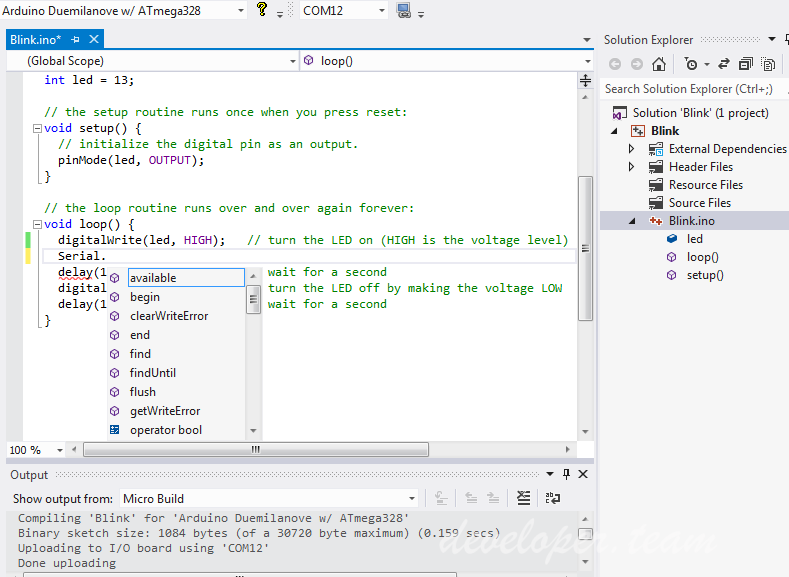 The Visual Studio and Atmel Studio IDEs are available for free for most users. When writing code with Visual Micro, if you adhere to the Arduino.cc rules then the code you create will remain Arduino IDE compatible. Use the Arduino compatible library and board managers to discover and download hundreds of Arduino compatible boards and libraries. Team capabilities of Visual Micro have been extended in recent versions along with better compatibility with the Arduino 3rd party hardware specification. Using automatic intellisense path management alongside crosss-platform shared c++ projects, teams can build Arduino compatible programs without treading on other feet! Arduino code created with Visual Micro can be shared with the windows, linux and mac Arduino community. Visual Micro adheres to the standards created by the various hardware manufacturers, such as arduino.cc. Put simply, this means that newly released hardware can be programmed in Visual Micro without need for a software update from Visual Micro. Visual Micro even uses the same configuration as the Arduino IDE! Arduino compatible hardware from a wide range of manufacturers is supported. Arduino sketch/project code does not need to change to work in Visual Studio, it remains fully compatible with the Arduino IDE (whichever version you are using). All Arduino examples for installed hardware and libraries can be used without modification. New Arduino users are guided to work within the normal Arduino framework, in a similar manner to the Arduino IDE. Advanced Arduino users have a range of options that allow the simple (but restricting) Arduino rules to be broken. The following example demonstrates the IDE in it's simplest form. Shared projects and shared libraries can be located in any location which makes source control and version control very easy. Another benefit is that Visual Micro provides varying cross-platform intellisense and build/upload when editing shared code. This is useful because shared cross-platform code does not have a specific architecture, therefore would not normally have platform specific intellisense or build/upload capability.